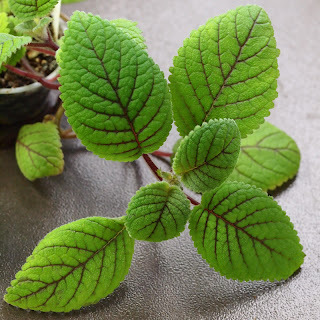 I brought my fairly leggy plant of Niphaea oblonga to our meeting for some advice on how to grow it well, since I was unable to find any information on line. After consulting The Miracle Houseplants, I learned that it is a rhizomatous plant native to Mexico and Guatemala. It grows 8-10 inches high and has beautiful burgundy veins on bright green foliage. It is a small plant which might be interesting in a container garden or artistic arrangement (which is probably why I bought it). I have not seen it bloom, but it produces white flowers with bright yellow anthers. It has a short blooming period before going dormant. My plant looked like it would make a nice hanging plant if there were multiple plants in a pot. However, I was told that it is an upright grower, which means it would need to be staked. 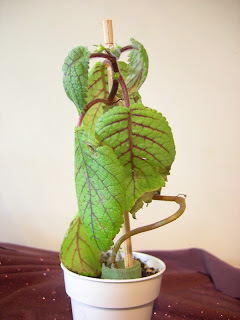 The stem on my plant is quite thin and twisted and not very sturdy, so I am now rooting some cuttings. It didn’t travel well and the stem is broken at the bottom, but I now have buds on it. I am looking forward to seeing it bloom. I suppose it will go dormant after blooming. After following the discussion on Gesneriphiles about storing rhizomes, I am wondering if these rhizomes should be stored damp or dry. In addition to The Genera of Gesneriaceae and The Gesneriad Reference Web webpages on Niphaea, there is also a 2008 article "A Review of the Neotropical Genera Amalophyllon, Niphaea, and Phinaea (Gesneriaceae-Gloxinieae)" by John K. Boggan, Laurence E. Skog, and Eric H. Roalson. Selbyana 29(2): 157–176 (2008).